Two classic California wines and a hand-selected variety of gourmet delicacies present a sophisticated selection that delivers all of the prestige and flavor of California wine country to leave a lasting impression this Valentine's Day. One bottle each of Mt. Josselyn Reserve Red, and Soda Ridge Chardonnay. For more information on these wines, please see the Tasting Notes. Lindt Dark Chocolate Chili Tablet, Chocolate Bourbon Caramels. Chocolate Cherries, Guylian Truffles, Kettle Popcorn and more. Your gift will leave a lasting impression as they continue to use and enjoy this signature keepsake woven basket, perfect for the home or office. Measures 14" x 13" x 7"
Toast of California Wine Basket is a hand delivered gift. These gifts are delivered by one of our local design centers located throughout the United States and Canada. Same day delivery is available for most gifts when ordered before the cutoff time. The cutoff time for Toast of California Wine Basket is 2 PM in the recipient's time zone. Mt. Josselyn California Mountain Reserve RedBig aromas lead to flavors of dark ripe blackberry, bing cherry, Italian plum and a hint of mocha on the palate in this Mountain Reserve Red. Soda Ridge ChardonnayA fruit-kissed Chardonnay with ripe apple and pear notes chased by a hint of melted butter. Big aromas lead to flavors of dark ripe blackberry, bing cherry, Italian plum and a hint of mocha on the palate. Well balanced with soft tannins on the finish. Pair with vegetable lasagna, burgers, or grilled chicken. This fruity Chardonnay displays ripe apple and pear aromas with a hint of melted butter. Creamy nougat, citrus, and hints of white nectarine combine elegantly with the wine's crisp acidity for a lingering finish. Pair with scallops and summer squash, or balsamic braised pork. Mt. Josselyn Reserve Red and Soda Ridge Chardonnay. GiftTree Signature Classic Woven Keepsake Basket. I ordered this gift basket to give to my coworkers & our staff, as a thank you for performing surgery on me. There was no way that I could ever thank them enough; however, this basket was a beautiful gesture of gratitude that they all loved & enjoyed! Everything from presentation to taste, was a sure hit! I received this wonderful gift basket from a friend and can't believe how beautiful and full of delicious goodies it is! I called immediately after opening it to order one to send to someone myself! Love it all! Highly recommend. Bought this for a good friends birthday and he loved it. The shipping was very fast. I had to switch the address last minute to my friends' job and customer service was fast and friendly. Will most definitely order from Gift Tree again. I am in London, England and sent this hamper to my sons' future inlaws in Texas USA. The delivery time scale was excellent. It arrived the next day. They loved the detail of the personalised ribbon and enjoyed to hamper itself. This was a problem free gift. I will be using this company again. I bought this as a thank you gift for friends who are my life savers. I didn't see the gift basket but my friend couldn't say enough good things about it. She and her husband loved the wines and all the goodies in it. This is only the second time ordering from Gift Tree and my first gift basket to another friend and her husband was equally great. The quality and prices are much better than other companies I've ordered from. The shipping fees are more reasonable also. The only little drawback was that I wanted this to be a surprise and I had to half give away the surprise as an adult signature was required because of the wine and I had to make sure someone would be home all day. Was please with the basket. Came 2 days earlier than shipping suggestion which was great. Recipient loved it to!!! The basket is a retirement gift for my sister after 50 years of nursing. I was so impressed with the gift basket I ordered for my mom for her birthday. First time ordering from GiftTree and I will continue! I will recommend GiftTree to everyone! Thank you again for the beautiful wine gift basket. This was a beautiful gift with beautiful presentation. The scissors were a special classy touch as was the fancy ribbon. The selection of items and wine was a nice variety. Very impressive! Very nice to get a nice gift basket exactly as pictures. The recipient of this basket was thrilled and said how beautiful and delicious it was. Enjoyed the wine!! I sent this to my sister and brother-in-law in Sante Fe, NM for a Christmas present and they said they loved it. I don't think you can ever go wrong with wine and food.....especially chocolates, right? I waited a little too long to order so it arrived after Christmas, but I think that is okay - it prolongs the excitement of getting a Christmas gift compared to receiving all your gifts in a single day. What more could I ask for? GiftTree customer service was cordial and efficient. Fast delivery was prompt and on time. The recipient of the gift did not have a chance to sample the contents of the basket at the time of this review but was amazed at how much "neat stuff" was included along with the wines. They can't wait for the right opportunity to sample. Arrived sooner than you would expect after being ordered days before Christmas. Email notification was a relief. It was very professional ordering and they updated me letting me know it was delivered and on time. Loved this company! We sent this gift to our friend for Christmas and they said it was wonderful. I am very happy with your company. Recipient really enjoyed his gift package. Good service and quick delivery. Order process very efficient as well. I had this sent to my daughter in California. She was amazed at the large assortment in the contents. She says it was packed full and arrived in time for her to share with her family for Christmas. The gift was very nice and they have already drank one bottle of wine at a get together last night. Overall the gift was very much appreciated and will probably do the same next year. I sent this to my brother who just bought a new home in Santa Fe, New Mexico as a house warming gift. He and his wife were so pleased and said it was great and came as a beautiful presentation. This was all they had to warm up with as they did not have any furniture yet. Nicely presented and very attractive! Speedy delivery also. I am most pleased with this gift to give and will use you folks again! Quality items and quick delivery. Very happy with my purchase. Will definitely order again. Very happy with this purchase. Shipping was fast as well. It's an absolutely beautiful basket loaded with goodies. Very nice selection. The experience was definitely a positive experience. Wonderful baskets to choose from at reasonable prices. Fast delivery! I sent this to a friend who recently lost her mother. Although I did not actually see it, she was blown away by this basket. She said, "It is truly the most amazing basket we have ever seen...Wow!" and "Nice doesn't even come close to describing it...it was huge, filled with fabulous goodies and beautifully packed. This was way better than flowers!!!" I purchased this for a close friend who has a death in her family and I had it sent to her. She sent me a wonderful message saying how beautiful the basket was and how much she has enjoyed everything in the basket thus far. Also the shipping was so fast. I ordered it last Monday and it was delivered Wednesday! I will definitely be doing business with GiftTree again! I purchases this as a Birthday gift for my sister in law. I do not know how it looks but I felt that the price was great and the speed in the process was wonderful. She got the gift the day they promised and seemed to be very happy with it. I would use GiftTree again, for sure. I got this basket for my parents and they really loved it!! Recipient was extremely pleased with this basket. Raved about contents! We purchased this basket as a 40th wedding anniversary gift for our parents and they absolutely loved it! Sent as a gift and recipient loved it. She said "We went above and beyond"
I have ordered from your company several times and have never been disappointed ( nor have my recipients). The quality of your products, the beautiful presentation, the courteous service and prompt deliveries have been greatly appreciated. I will proudly order from you in the future! Got it for my mom for Mother's Day and she said it was too pretty to open!! Score for me. The recipients absolutely loved their gift. This basket is so beautiful and classy. I wish someone would gift this to me! Btw the delivery was very thoroughly done. Thank you! Mom was very happy with the gift. We sent this to Mom for Mother's Day. It was our first time using your company. Mom was very happy with this gift. She loves wine and was surprised at all the other goodies in the basket. She even mentioned she loved the basket it all came in. She said it was beautiful. She called right after receiving it, so she was very excited. Thank you for making our Mother's Day a big success. My Son sent this to me for mothers day. Great quality items. I was pleasantly suprised when more items where under the paper not just filler. Presentation was great!!! Thank you!! It's great to know I can shop blindly and trust a company to provide a 5 star service. I will be using you guys again! !! 2nd time I used this gift! My mom loved this for Easter. Cannot wait for Mothers' Day. The gift basket we ordered was for a very special person and she loved it. Thank you for a very fine gift selection. We will be sure to use your company in the future. I purchased this basket for my cousin who lost her husband. She said that when she received it, she cried at how beautiful and thoughtful it was. She said it made her day. Who could ask for much more than that? Beautiful Basket, Extra special touch! This was my first time ordering from GiftTree and certainly won't be my last! Not only did the basket come in a beautiful presentation and perfectly on time, but a fellow employee of GiftTree understood the comical value of my gift to my best friend. They added a personal touch and WOW'd both myself and the recipient. I could not be more pleased with this company! THANKS FOR MAKING my scissor gift extra special! Can't wait to order from GiftTree again!! Sent this to my sister when I needed a quick, high quality gift. It was delivered in two days and she loved it! She sent me several pictures as she discovered extra items in the basket. Would certainly order again! Bought this for my Dr. I looked everywhere to find the perfect gift to thank her and this seemed to look appealing. I was pleased with the estimated delivery date and the description of the package. I was mostly pleased when my Dr called me to thank me saying how beautiful my gift was. Thank you!!! I sent this basket as a thank you gift. The recipient of this basket was blown away with the content and the presentation of items in the basket. Thanks for expressing my gratitude to someone who jetted me in many ways. This will be my go to for future thank yous. Customer service was helpful and pleasant. Delivery was on time and before Christmas as promised and the recipients were happy with their gifts! It was the first time I've ordered but not my last. High quality of mechandise well presented. People I gave your gift to were happy with it. Basket was a gift,( I never actually saw it) but they really seemed to like it. Shipping was very good arrived as scheduled. I ordered 4 of these baskets for my siblings for Christmas. They all raved about the quality of the contents, and how beautiful the packaging was (especially the little pair of scissors)!! I will definitely be using Gift Tree in the future!! Gift Tree did everything they said. The gift arrived on time and was beautiful. Wonderful service, amazing quality and speedy delivery. I sent this to the office of my Attorney and his Associates as a combination Christmas and Thank you gift. 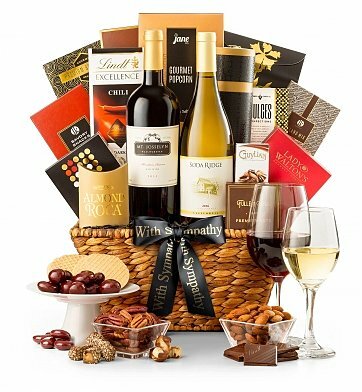 I did not see it, but based on the "Thank You Note" which I received, I understand that it was a beautiful and well presented Gift Basket with excellent wine and lots of delicious goodies! The Customer Service, Tracking Information, and Follow Up by Gift Tree, sets your mind at ease and allows you to relax, knowing that your gift will get there as promised. I ordered the Toast of California Wine basket for a newly engaged couple, and I was so glad I did. The basket was so pretty, full of good things, and it arrived almost as soon as I ordered it! I had also ordered a birthday basket a couple of weeks earlier, and the recipient was happy with it and its contents. I would definitely recommend Gift Tree and plan to use their services in the future. Sent a basket to my Mother for Christmas. She said it was lovely and did not want to open it. When she did open it she just raved. Great service and recipient was very happy. A great gift package. The Gift arrived on time and was very well prepared. I would recommend this gift to anyone who enjoys a few good things in Life! Because they desrve it! My gift got rave reviews. Sent out the toast of California wine basket to my parents for a gift. They have been raving about the quality of the items as well as the extraordinary details taken to insure they were satisfied. The little scissor to help them open the individual packaging was a nice little touch. We will definitely use the gift tree website again. I bought this for my aunt to thank her for helping me during the wedding. She loves it! It arrived on time, and I got an email letting me know they had received it. I definitely plan on using gift tree in the future. I bought for a birthday for my sister and she loved it. She was impressed by the ribbon with her name on it. She said everything was delicious. It was on time and presented nicely. Amazingly fast service! Excellent products just as described. Have used GiftTree for my real estate clients as closing gifts. They have always provided great service and products! My clients really love the gifts they receive! First time using GiftTree. Sister and husband loved the basket. Would definitely use GiftTree again. Bought two for my coworkers as a get well gift and they loved it. They couldn't stop talking about it. Now it's the standard for our office. The basket was perfectly presented to one of our co-workers who left to take a position in California. It arrived on time and packaged perfectly with the correct information on the card. She was very excited and really like the basket. I sent a gift basket to my daughter and the carrier had trouble delivering because of her work schedule. After calling GT and calling the carrier they were able to meet my daughter right at 5:00 and deliver a welcomed housewarming wine basket. Great basket full of goodies! My brother is a very difficult person to buy a gift for, but he absolutely loved this gift! I sent this basket to my friend in Seattle for her birthday. She told me that she was delighted that I sent her such a beautiful arrangement. The basket arrangement was beautiful. She will let me know later how everything tasted. My mom says the wine was good quality and the "goodies" were great and plentiful. My mother and aunt truly valued the gift called Toast of California Wine Basket. Their emotions were overwhelmed with joy. I recommend this gift not only for Mother's Day but, any other occasion. The package was a present for our son and his girlfriend. They were very happy with the basket! Sent as a sympathy gift and was very much appreciated by the recipient. She said she couldn't believe all the nice stuff in the basket. Must tell you though that at first I was a little worried because she told me there was no wine in it. I called customer service and they told me to make sure she had checked the bottom of the basket. Sure enough it was there plus more goodies. So make sure that whoever gets this baskets knows to look to the very bottom of the basket!! Received this as a gift from my boyfriend. Came beautifully packaged and arrived quickly with no problems. This is not my first time using GiftTree, but it is my first time receiving it and I must say, it truly is impressive and I had no idea of the quality until I received one myself. You are now my #1 for gift basket purchases. Service is wonderful and I get email updates every step of the way when I use their service. Receiving one myself was simply too good to be true. I ordered this wine basket for a friend for her 90th birthday & she called me to tell me how beautifully the gift was packaged & how pleased she was with everything!! We sent this to our son and his wife on their 25th wedding anniversary . They were thrilled ! It ment a lot to us because they live many states away and we could not be there. We were so pleased to know how much they loved this gift basket. Thank you! Bought this gift as a birthday gift for my daughter. She loved it! I would definitely purchase gifts from GiftTree from now on. Sent this basket for a birthday gift. My uncle said it was the best gift basket he has ever received. Our family was delighted with this gift basket! Perfect gift for a tough time. Thank you. What a wonderful gift to send to our dear friend on death of her husband. So many flowers are sent (and it's cold in the north) and so much food is given. Wine is perfect for a chance for her sit back and reminisce and reflect on their beautiful life together. Thank you doing such a great job. The couple I sent it to said it was so gorgeous they just wanted to look at it and not open it. The gift was delivered exactly as they stated and yes I would use this service again. We sent this to our daughter congratulating her on her academic achievement. She was just thrilled with this surprise basket full of goodies! The white satin personalized ribbon was beautiful and the contents of the basket were plentiful, unique and delicious. Delivery was very speedy, as promised. Thank you GiftTree. I sent this basket to my Mother for her birthday and she was thrilled! I stayed on the phone with her as she checked out all the items. It was like Christmas morning. She loved it! Sent to niece and she was absolutely delighted with it!! We sent this as a thank you for a friend who hosted us. The basket arrived when promised and the presentation was flawless. We ordered the Toast of Ca Wine Basket. It was delivered as promised and as advertised. Our friends were thrilled at the assortment and arrangement! Ordering process very simple and easy. I am getting ready to place another order for an anniversary! The best gift basket ever and quick delivery! Thanks for the speedy delivery. My clients were very happy with the gift. Gift arrived on time and in excellent condition. The recipients were thrilled! I would highly recommend GiftTree and this product. The package was affordable and delivered in a very timely manner. The recipients seem to really like it. They took a picture of it and sent it to us. It looked very pretty. I'm not sure about the quality of the products since I didn't taste them but I'm assuming they were fresh and good. Gifts were well received and enjoyed. This is my second purchase from GiftTree. Another good example of Quality and Customer Service. Thank you so much for getting gifts delivered when promised, to my physician's office prior to his leave of day. I am recommending and boasting about your products. My husband and I sent this to some friends and she called me several times to say thank you for the basket. She went on and on about how beautiful it was and how even the snacks contained within the basket were snacks that people would actually eat! : ) And I must say GiftTree, was on point with delivery. This was my first time using GiftTree, however, it wont be my last! This was a gift for my son. He said it was really nice, put together very well. I would definitely recommend using GiftTree. The gift basket arrived as promised & they loved it especially since I sent one each of the Red & White Wine!! It was the perfect gift not too mention the other goodies that was in the basket as well! They were very pleased & said the presentation was lovely!! I sent this to a wine and chocolate person and her family as a Christmas gift. I received a note soon after they received the basket that they loved everything in the basket and devoured everything pretty quickly. I was told the wine was "good" and they already had plans for the white after finishing the red the first day they received the basket. I would definitely use GiftTree again. Great customer service and pricing for the product! The presentation is beautiful. I've sent this twice as gifts and the receivers could not believe it. They were so impressed. I was thrilled with the response of the receivers. The recipients of this housewarming gift were thrilled. It arrived ahead of schedule. The first thing mentioned was the personalized ribbon. I had considered not using this option, but am so glad I did. Since it is Christmas time, the ribbon was woven into the tree branches. One member of this couple is vegan and there are goodies enough for this hard to buy food for pallets. I will use your service again. Thank you. This was a gift to my Professional Associates. I've sent it out twice. They were overwhelmed with how lovely the package design was and excited to try everything. Beautiful presentation. Our friends who received this gift absolutely raved about it. What more could we ask for. She was positively giddy over the real gift basket, wine and scissors to open the box. She was positively giddy over the basket, wine and scissors to open the box. The recipient of the gift loved it! I ordered this from England to be delivered in California. The communication was great from step one and that meant a lot to me as I was 6000 miles away! I would recommend this company as it was such an easy process. My brother loved his Toast of California Wine Basket. He remarked the presentation was beautiful and I was delighted with the service. Highly recommended for a special occasion! Thank you GiftTree. Just received and was so impressed!! Was the recipient of this basket today and was so impressed with the quality and attention to detail. I am very happy with the choice and customer service at GiftTree. The recipients loved this gift. A first rate experience! This was a gift for my husband, whom I might add is extremely picky.Presentation of the wine basket was outstanding, I had his name added to the ribbon, which he adored.... Simply gorgeous!!! He loved it! His entire office were very impressed. Will use GiftTree again and again. Good job guys...You Rock!!! We sent this as a wedding gift and it arrived just as in the picture. They loved it! I would recommend this to family and friends. My friend was very pleased and said the basket not only made an impressive presentation but after trying some of the food and wine, said that everything was great and it was all a hit as well. I will for sure order from GiftTree again in the future. The gift basket I ordered was great! Great gift and service! Recipient was very pleased as was I! Thank you! I spoke to a customer service rep and she made a few suggestions on what we were looking for. This was a big hit for my sister who just retired after many years of work. The ribbon was a great touch. This gift was for my daughter. She was ecstatic. Haven't spoke with her about other items, but she enjoyed the wine. My friend said it was amazing and loved the selection of treats! Great gift and prompt shipping! My mom loved everything in this basket! I purchased this Basket as a Birthday gift and I couldn't have been more pleased! Thank You again GiftTree for an amazing gift!!! After reading the reviews, I felt pretty confident sending this gift basket but after it's arrival I am 100% confident that it was the right decision. I have been told numerous times how wonderful it was, that when they opened it: "things just kept coming & coming, one after another, making it hard to choose what to indulge in first". It was definitely worth it. Came through with a very nice Wine gift basket to a friend of mine who needed cheered up after 8 days in ICU. I would definitely use the Gift Tree for gifting in the future. Recipient stated the basket was beautiful as well as the wonderful assortment of snacks. He loved the wine choices.. The gift arrived on time. Very pleaing to the eye. Since this goes to my granddaughter in Florida - I rely on her opinion - she was very pleased with the basket and the contests. Many thanks. I sent this basket as a birthday gift and received an overwhelming thank you from the recipient. The assortment of items paired with the wine were well received. I sent this to a relative who has been ill and it was the perfect thing to cheer her. My parents loved this gift i gave them and said it was super yummy! My son's drink very expensive wines and I was hesitant to send this gift. They both said the wine was just fine and the whole gift package enjoyable. Off the above: more cheese and crackers in place of candy would have been nice. Cheese and wine are great together. This wine basket was perfect. The combination of items were just what I needed to give to my friend. The arrangement was spot on. I would purchase this basket again and again. This basket is simply the perfect gift a wine lover could receive. My husband and I have decided to get this for my mother for the holiday season since we live miles away from each other. My mother loved everything about it. From the basket to what's inside the basket. She was so excited! She shared the bottles of wine with my uncles and aunts and they all loved them. A great gift for a great price! I was very pleased with my experience with Gift Tree. The package was delivered on time as promised. And what was nice about the experience, was Gift Tree alerted with daily status e-mail updates. Not many services provide that feature. I was pleased with that. I'm sure the contents in the basket are wonderful. My only criticism is that the price seemed awful high. But nevertheless, I was happy with the purchase. We sent this basket to our niece and her husband. She said it was beautifully packaged. They enjoyed the wine and other goodies. She has been using the basket for other purposes too! This was a lovely and useful gift. I don't drink, don't know anything about Wines, but made what I thought might be a safe choice for people who celebrate the Christmas festivities. I got feedback that they were very happy. So mission accomplished. I ordered this for my brother and sister inlaw in Texas. They loved it; beautiful presentation, timely delivery, satisfied customers! My cousin loved it! Beautiful presentation, high quality products and Great customer service! Thank you GiftTree!! I ordered this basket for my dear friend for Christmas. She called me a couple of days after she received it and raved about how wonderful the wine and contents were. She also loved the basket! I wanted to surprise her with something other than flowers or fruit and this definitely thrilled her. She thanked me from the bottom of her heart. I will be ordering from GiftTree again. I ordered this as an unexpected christmas gift for a good friend who exclaimed what a " really, really nice basket this was". She said it was chock full of goodies, she kept pulling things out and it kept going "on and on and on". With this reaction I will be using gift tree in the future. Such a quality gift for a reasonable price that made my friend feel really special, thank you so much. Great item! !..Beautiful basket..Fast Shipping,,I love IT THANK YOU!!! I sent this to my brother & his wife. I was notified when it was shipped and even more surprised to get an email from Gift Tree letting me know it had arrived and what time it was delivered. Even got a follow up call from Gift Tree to see how service was (which doesn't happen much now days)...I was really pleased and would certainly recommend them to friends. My brother loved it! I sent this to my parents for their Anniversary. They were thrilled! Mom loving Red and Dad who prefers White makes this basket the perfect pairing! And the accompanying assortment of "goodies" makes a complete gift. Bought this as a christmas gift for our son's girlfriend- timely delivery- she loved it-plenty to share with her room mate! I wanted to order a present from UK for family in LA. Couldn't have been easier. Family were delighted with gift . I will certainly be using this website again. I ordered this from Australia to be delivered to Las Vegas and it arrived on time and received rave reviews. reasonably priced, and it was delivered quickly. I was very pleased and happy and so were my friends. Thank you!!! I would definitely recommend and use Gift Tree again. Sent to an East Coast customer, they absolutley loved it! Especially coming from a California vendor. I highly recommend this product! I ordered this as a gift for friends. They called and said they loved it. I can never go wrong with using your services! Absolutely first class service, as always. my family in LA received the gift within four days of my placing the order in England. Will continue using Gift tree in the future. Lovely Wedding Gift- Get the Personalized Bow ! Presentation was nice- just remember the items will be cellopane wrapped for shipment. Basket contents doesn't arrive "fanned" out like picture represents. I've ordered several items & gift baskets from GIFT TREE- they are a dependable source for internet shopping. My recipient gave this basket a rave review. She was very impressed. I'm sure, thru her, you will now have another customer. The product was a gift, so I did not see it. However, my son said it was lovely and contained a lot of good stuff. Delivery was excellent and the gift arrived when it was expected. I would order from this company again. Purchased for family who happens to be a physician. Great house warmer. Received this basket as a gift. Loved everything in it. The wines are great and I will seek to buy from this site in the future. Thank you. Dearest Friends sent this lovely basket as a thank you for a recent visit to us in Chicago. The personalized presentation was so impressive we felt we should send a thank you! The California wines were perfect since we live in California for several months a year and the Winery name Jericho was perfect since we're on our way to Israel! All the goodies were deliciously indulgent. We will certainly use this company for our future gift needs. My son received this basket for his 24th birthday and thought it was awesome! Great choice of wine and snacks! Being able to choose from so many different levels of gift baskets and themes makes deciding what to send a difficult decision :) The selections, the communication from Gift Tree as to when the basket will deliver and then again after it delivers is superb. I think that my favorite part of ordering a Gift Tree Gift basket though, is the fact that I can personalize the ribbon. The personalized ribbon is a show stopper. I can't wait to order from Gift Tree again! my brother like it a lot. I sent this gift as a token of appreciation to a sales manager. The item came on time and the recipient indicated that basket was beautifully wrapped and he and his staff enjoyed wine and the contents. They were impressed. Only thing is that the note was misplaced so the recipient had no clue who sent the gift. I bought this basket for my cousin, & her husband. They just loved it. The wine was delicious they said, & I had the ribbon on the basket personalized. They said they had never seen anything like that before. And they also said they loved all the goodies that came with the wine. I sent this to my cousin back East whose husband is sick. I cannot believe how fast they received this, in two days. And, she raved over it. She loved both wines, and all the goodies. I had the ribbon personalized, which she also mentioned as so unique! I have used other winery sites before, but this one is now my #1. Just great service, and great products. Wonderful gift for someone you love! The Toast of California Wine Basket was a wonderful anniversary gift for my daughter and her husband who live in Northern CA. They loved it....every part of it and delivery time was perfect. Everyone I send a package to through your company, just loves it and tells me so. Thank you for making me look good! recipients were thrilled and loved everything! gifttree in the future. Great quality. I received RAVE reviews from my coworker who I sent this to. She absolutely LOVED it! I also splurged and bought the personalized ribbon. WHAT A HUGE HIT! Can't go wrong! I also need to mention the fantastic customer service. That alone had me sold! THANK YOU GiftTree.com! My daughter and son-in-law were thrilled-it was their 1st Wedding Anniversay-the gift basket was an impeccable way to celebrate! Thank you so much! Basket was not delivered on Valentines Day. When basket was scheduled, did not get to office until after closing time. I rescheduled delivery and basket was delivered as requested. Loved the personalized ribbon - gave the basket a special touch! The basket was delivered before the specified time, however it did not cause any problems. The recipient was home from the hospital luckily and able to enjoy the surprise. My daughter loved the basket. It even came with scissors. It was an anniversary gift. Will shop with you again. I sent this basket as a Thank you gift and the recipient was happily surprised when it arrived at her door. It arrived 2 days ahead of schedule, I was very satisfied with my purchase. I ordered this gift basket for my son and daughter-in-law in Va for Christmas. They both LOVED the presentation, the food was fabulous! and my Son was AMAZED at how great the Red Wine was. He said he had not tried the white yet, but, they were looking forward to it! Thanks so much for sending the product exactly how it is presented on your site! I will definately be using GiftTree again! This gift was for my Aunt and Uncle. They received it just in time for Christmas, although I didn't order early enough. My aunt sent me an email as soon as she got and she mentioned the beautiful presentation and the excellent selection of wine it was. GiftTree.com surpassed my expectations and I highly recommend it to all. The included scissors to open the wrapping was a nice touch. Definitely will order from GiftTree again. There is something for the whole family--mom & dad love the wine and the kids will love all the goodies in the basket! "WOW an amazing thing to receive, thank you so much!" was the response I had after sending the Toast of California Wine Basket to family members in L.A. They were delighted with the presentation and contents. I placed the order from Australia and was impressed with Gift Tree's service. I was e mailed shipping and delivery details and the gift basket arrived by the due date. We sent two baskets back East to Grandparents, they arrived on time and they raved about them. We were very pleased with the whole process, from ordering to delivery. My friends enjoyed it very much. We bought this for a couple that we are friends with, and they absolutely loved it. It was also a great value for what we got, thank you GiftTree! They say they're eating on it a little everyday. Nice convenient way to gift! I was told it was a nice gift!! Very pleased from start to finish with giftree, highly recommended! I purchased the beautiful Toast of California Wine Basket for my daughter. My daughter is someone who really knows her wines therefore they had to be good. Gift Tree's service is easy and very efficient. I plan to use their service again. I bought this for a Christmas gift. I haven't seen it but they told me it was lovely. Our son and daughter-in-law both loved the selection and quality of the products in this gift basket. They were effusive in their thanks for such a nice gift. My wife and i bought this for our mom just a few days ago for her birthday and you know what she was estatic she loved it this is a wonderful gift for any occasion and the value you can not go wrong!!!! Your birthday gift was so much fun to open. Each time I took something out, there was another surprise hiding underneath it. All the things that I love, too. It really made my day. Thanks so much! You are an awesome sister! I just wanted to say that the delivery is right on par! I love the prompt service because I've experienced bad ones in the past. For now I do not know what it exactly looks like but once I found out, I will post a review! Depending on what the presentation I will hear from the receiver, I definitely would recommend this site for gift delivery. I purchased this as a Mother's day gift. My mother absolutely loved the personalized ribbon and the fact that they included a pair of scissors to make the package easier to open. The basket was had classy and exquisit presentation. I am sure the food and wine will be as wonderful as the last basket was. This is the second order I have placed with this company and I am sure it will not be the last. They do a wonderful job. My mother couldn't have been happier over the gift and is already planning what she can do with the beautiful basket. Sent this to my sister in New Jersey, she was delighted with the product. I was delighted with the customer service of GiftTree. I will use your service again in the future. Wonderful! I received this basket as a get well gift and am just finishing the treats. I was so pleasantly surprised that each flavor of each item was something I usually buy anyway, therefore I loved everything! I have a new favorite red wine in the Jericho Trail. I purchased this for my aunt who has everything. She called me yesterday when it was delivered and she was ECSTATIC! She pulls no punches and described a high quality gourmet gift that took her breath away. Highlights: great presentation, perfect selection of treats & wines and even a small pair of scissors for ease of opening treats! It was PERFECT and I will order this basket again! This basket was a New Year's gift for son and fiance, when they returned from a Christmas trip. It was just a perfect sampling of a variety of items for them to enjoy as they "decompressed" after their cross-country trip. This was a gift for Christmas. My recipient loved everything in the basket. This basket was not only a great price but beautiful as well. The quality of wine far exceeded my expectations. The nuts, cookies, crackers and chocolates were all delicious as well. This lived up to my expectations based on the person who recieved it comments. Timely delivery and easy website. Thanks. Awesome customer service on the phone, very friendly agents, package looks great, speedy delivery, thank you!